← Penhaligon’s Fragrance Profiling – a truly scent-sational experience! 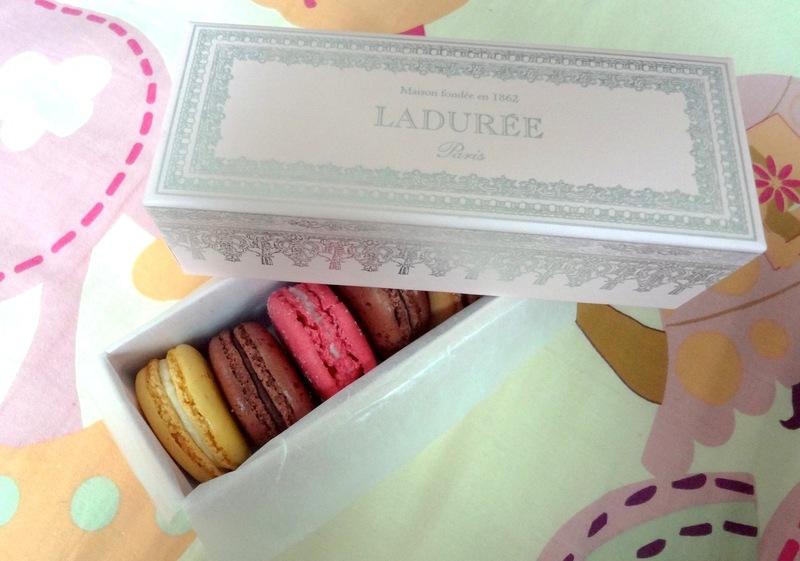 Dessert of the day: do Ladurée macarons hit my sweet spot? What with Ladurée and Pierre Hermé opening here in swift succession, Hong Kong has gone totally macaron mental. And whilst my sweet tooth knows no bounds, I do draw the line at queuing hours for what is essentially a little puff of sugary air! So… six months after opening and with everyone flocking to Pierre Hermé in ifc instead… I finally hit up the Ladurée’s Hong Kong store in Harbour City. Better late than never right? 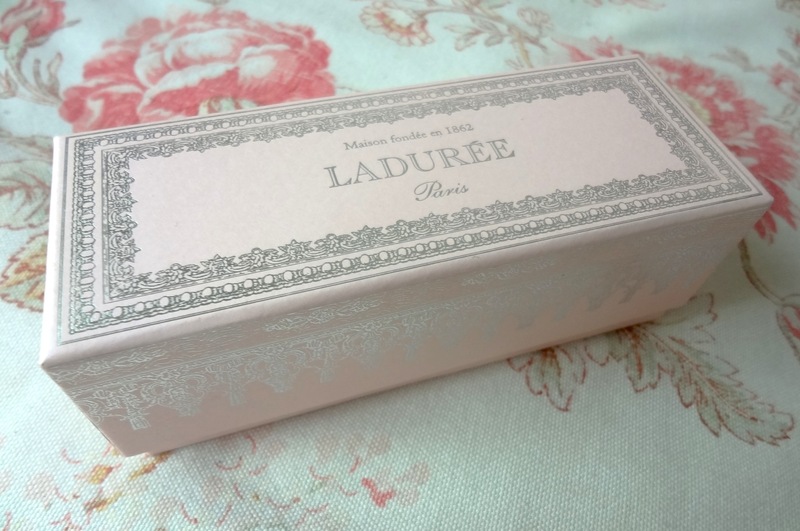 The six sweet treats that made it into my pretty-in-pink box? Salted Caramel (x2 of course! ), Ghana Chocolate, Yuzu Ginger, Chocolate Coconut Marshmallow and Strawberry Candy Marshmallow. The perfect macaron is all about the balance between a crispy shell-like crust, a soft chewy meringue interior and a creamy indulgent ganache filling – and the whole thing should still be so feather-light that six macarons later, you barely even notice that you’ve eaten any in the first place! Think of them as the naughty angel’s whispers of the dessert world. So does Ladurée find the perfect balance? Pretty spot on, I’d say. My favourite of the batch was Ghana Chocolate, which was rich with intense moreish chocolate flavour and a seductive to-die-for ganache filling. Close runner-up and current Rach obsession goes to Salted Caramel – that indulgent caramel sweetness with a spiky twist of salt is always a winner and this was pretty damn tasty… although for me, Pierre Hermé’s version does edge it with an even more intense caramelised taste. I also really liked Yuzu Ginger; it had a lovely summery burst of citrus fruitiness, plus a final ginger punch that added a nice kick to proceedings. However, I found the Chocolate Coconut Marshmallow and Strawberry Candy Marshmallow macarons too blandly sweet; given how delicious Ghana Chocolate had been, I was particularly disappointed with how insipid Chocolate Coconut was (a richer chocolate taste would have been so much better! 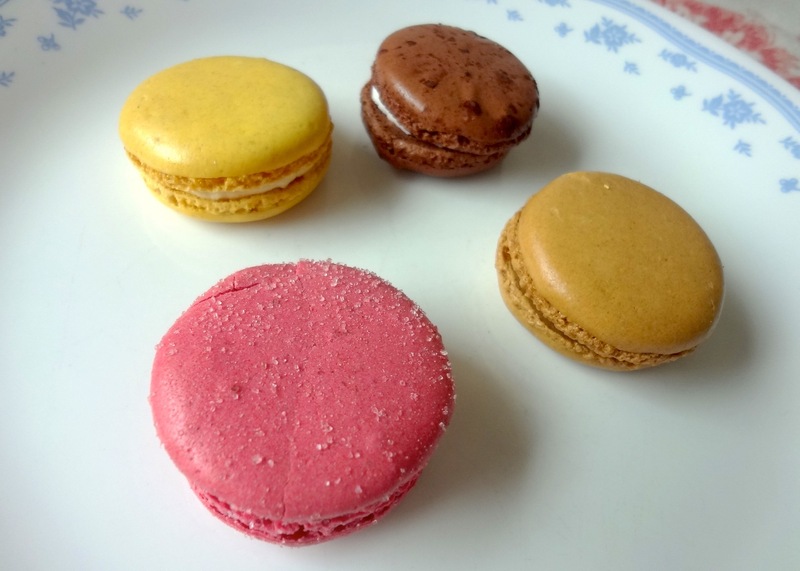 ), even if the chewy marshmallow filling was a cool twist on the traditional macaron set-up. Hong Kong isn’t really built for macarons, especially in this humid summer – but Ladurée’s directions to refrigerate the macarons, then leave them out for 10-15 minutes before eating, worked well and left the textures pretty much in tact… even if a couple of my macaron shells didn’t totally survive the journey back home from TST! 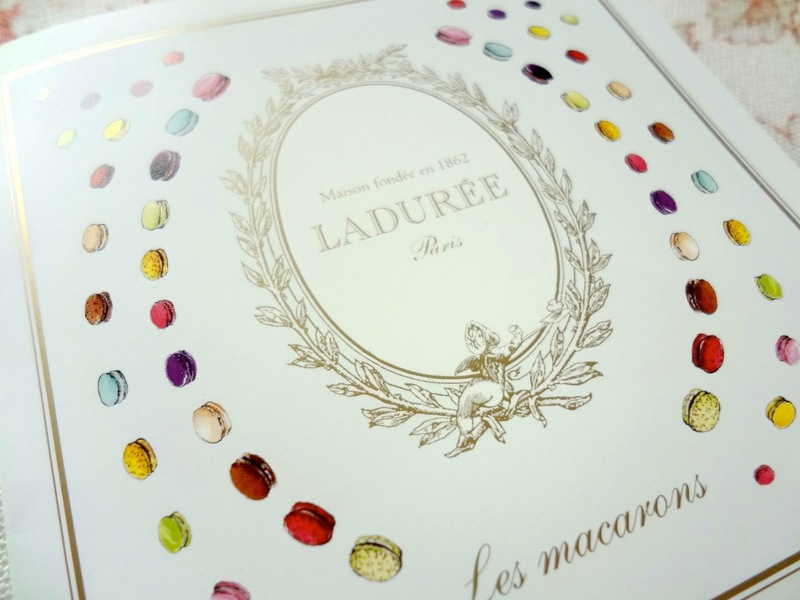 A box of Ladurée macarons costs $190 for six (or $250 for eight) – and let’s face it, you’re paying largely for the packaging. Unfortunately, for hoarders like me, the box is just way too pretty to throw away; I’m gonna play the value-for-money card by claiming it’s reusable for errr… jewellery? Teabags? Tampons?! Well, I haven’t quite figured that bit out yet but given how much the damn thing cost, I definitely WILL be using it for something… anything! 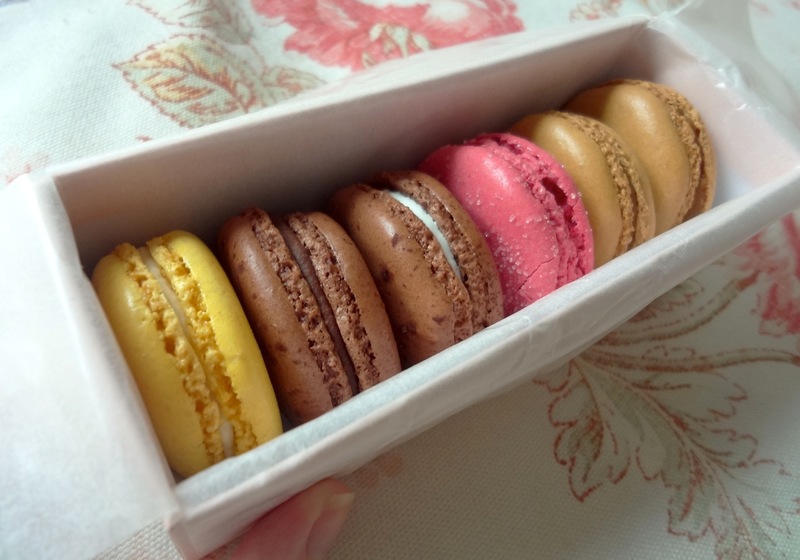 You can also opt to pay $23 for each macaron sans packaging (instead, they’ll come loose in a paper bag) but honestly, these delicate creatures will probably get crushed in your handbag unless you’re planning on scoffing immediately, so I do think the gift box might be preferable. 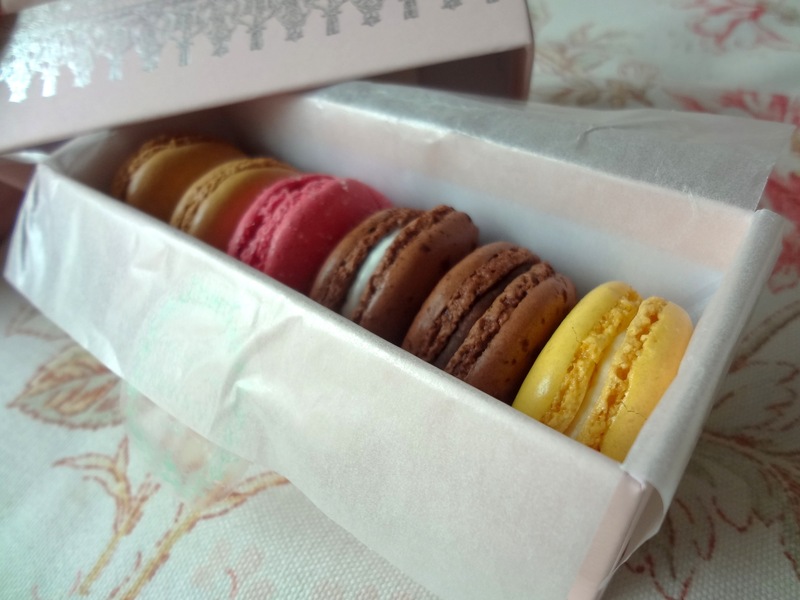 Although I have no quibbles with the quality (although based on my selection, Ladurée might be generally a little over-sweet for my tastes), I’m just not sure macarons rate highly enough on my sweet scale to make these a regular re-purchase. Roughly the same amount of money would also buy me six Sift cupcakes… and they take more than two bites to consume and feel a bit more substantial for the price tag (plus I’m properly addicted to their Smores and Salted Caramel Chocolate ones!). Macaron mania vs cupcake craziness? So far, it’s one to the cupcakes. Macarons ON cupcakes, however? Now you’re talking! 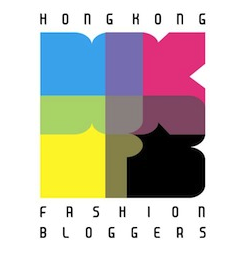 This entry was posted in Food, Hong Kong, Pretty Things and tagged best dessert hong kong, best macarons in hk, best macarons in Hong Kong, best macaroons in Hong Kong, dessert, dessert hong kong, Laduree, Laduree Hong Kong, Laduree locations Hong Kong, Laduree macarons, Laduree stores Hong Kong, Laduree stores in Hong Kong, macarons, macarons hk, macarons hong kong, macaroons, review, where to buy Laduree in Hong Kong, where to buy Laduree macarons Hong Kong. Bookmark the permalink. Somebody brought these things to the office. They’re just too sweet for me, I’m afraid.